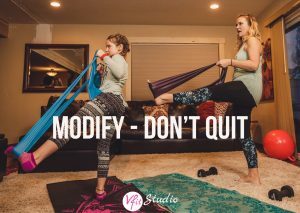 When The Going Gets Tough, Modify – Don’t Quit! And Here is Why! This is the time that New Year’s resolutions start to fade as real life roadblocks start to happen. Do not underestimate the power that reading motivational material can have in your life. Your brain is a muscle, and like any other muscle in the body, should be trained in a positive manner. As we said last week in our inspo email: You are never stuck at the bottom unless you choose for that to be the case. There’s always another option to get up, and our team is like none other, in that we will help you do so again and again and again if needed. Thank you to those who reached out on this heartfelt message and took us stick, because as humans we are not programmed to go at things alone. In life, you have to be realistic and understand that things are never going to be 100% as you planned or envisioned. That the magic really comes in sticking to your goal, long after the mood you set it in fades. It’s easy to set goals and have all the dreams in the world. It’s showing up, especially on the toughest days, that builds your character and will get you to your goals. It’s moving past road blocks, mental and sometimes physical. You only have so much control with what happens, and sometimes you fall down – sometimes there’s a challenge greater than you, that you are not able to meet, and it’s at these moments that you need to dig deep and DO NOT QUIT. // You hurt your ankle tripping over a toy that was left on the stairs. What do you do next with your exercise routine? Do you let it fall by the wayside for the next 3 weeks as it heals, or do you keep going with modifications? There’s SO much you could still do! You can still work on upper body strength with weights. You can still work on core strength with several floor exercises in a class like Pilates or Core & Caboose. You can still from a knee position continue to build total body strength with plank holds and several versions of push ups. All without standing on your hurt ankle. All still moving. All still having support and being safe. All without quitting. // A long series of events in life has you sedentary and it’s been more than 3 years since you last intentionally broke a sweat. You finally decide it’s time to focus on self care and hop into a class. <<< YAY! But then, once you log in you see a spitfire instructor jumping around with the first move of the class with jumping jacks. You can’t jump yet, your body is not ready for that – and that’s okay. What do you do next, though? Do you log off and say ‘I can’t’ or do you follow along with the 5 other modifications given by the instructor and work the low impact jumping jack and get that body moving? Working moves with low impact, meaning one leg is on the ground at all times, no jumping, is a great way to build strength and get your heart rate up. Our instructor team shares low and higher impact options for each cardio moves so at all levels of our teammates can continue with movement in each class. In EVERY SINGLE VFit class, you are given modifications and progressions for EVERY level. If your workout routine/trainer is not doing this, I would question who you are putting your health on the line with. Even extreme athletes go through set backs and need to scale their movements and intensities back. Any good trainer out there should be skilled in making a class safe and comfortable for a beginner, yet challenging enough for an athlete. At VFit we hang our hat’s high on our ability to do just that! // You’ve been sick as a dog the last 2 weeks with that cold that won’t go away and you are finally back to working out. You log in to your favorite class and are so out of breath during the warm up, that you want to give up, log out, and be bummed out with yourself for giving up. Give yourself some grace when coming back into it after not feeling well, your body is still recovering. If you were able to push 100% the last class you took, but today it’s 10%, let that be the case. Stop and take those water breaks you need. Move those planks from the floor to the wall. Scrap the burpees and go with the modification option given by the instructor to stay standing and do lunge, squat, lunge. Work with the body you have today, and just know that any minute of exercise you get in greater than 0 is a win. These scenarios above may hit a chord, or remind you of how it feels to be stuck and frustrated that you cannot do something. We’ve all been there. But success is all about how you handle these kinds of moments in your life. If you’ve been totally throwing in the towel each tine a roadblock comes, we encourage you to work to find new ways to work THROUGH these challenges. Modifications are alternative paths that will lead you to your goals. Quitting will lead you to starting over for the rest of your life! You deserve better than that! It may take slightly longer to get there, but the momentum is FORWARD, and that’s what you want! If any of this feel familiar and you are ready to make a change and get back up, our team is ready to welcome you with open (strong) arms. There is another way, the VFit way.